A porous medium is composed of a solid matrix and its geometrical complement: the pore space. This pore space can be occupied by one or more fluids. The understanding of transport phenomena in porous media is a challenging intellectual task. This book provides a detailed analysis of the aspects required for the understanding of many experimental techniques in the field of porous media transport phenomena. It is aimed at students or engineers who may not be looking specifically to become theoreticians in porous media, but wish to integrate knowledge of porous media with their previous scientific culture, or who may have encountered them when dealing with a technological problem. While avoiding the details of the more mathematical and abstract developments of the theories of acroscopization, the author gives as accurate and rigorous an idea as possible of the methods used to establish the major laws of macroscopic behavior in porous media. He also illustrates the constitutive laws and equations by demonstrating some of their classical applications. Priority is to put forward the constitutive laws in concrete circumstances without going into technical detail. 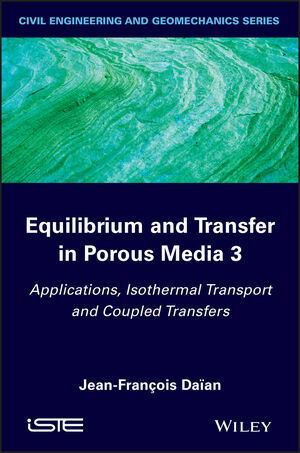 This third volume in the three-volume series focuses on the applications of isothermal transport and coupled transfers in porous media. Jean-François Daïan is a retired and voluntary researcher at LTHE (Laboratoire d'Étude des Transferts en Hydrologie et Environnement) in Grenoble, France, having worked there as a lecturer for nearly 30 years before his retirement. His main fields of research include porous media, pore structure characterization: mercury porosimetry and the application of percolation theory. He is the co-author of the XDQ (Xu Ke, Quenard, Daïan) model.